He is wonderful. Very friendly and easy to talk to, explains everything in an understandable way (no complex medical jargon)and is straight to the point. Also, he's on time! He does not leave you waiting. My appointment took all of 25 min and I was out the door with the proper meds! He is wonderful. Very friendly and easy to talk to, explains everything in an understandable way (no complex medical jargon) and is straight to the point. Also, he's on time! Hedoes not leave you waiting. My appointment took all of 25 min and I was out the door with the proper meds! Overall fine, the office is clean with up to date technology! The wait times varied but were okay. Some close contactat times, but knowledgeable at best. Overall fine, the office is clean with up to date technology! The wait times varied but were okay. Some close contact at times, but knowledgeable at best. 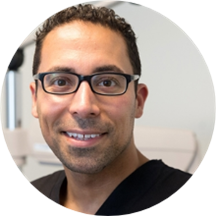 Dr. Nima Moainie completed his residency at Georgetown University Ophthalmology Department and has served as chief resident while at the National Veterans Hospital. He is an active cataract surgeon who also does many other surgical and non-invasive procedures for conditions such as glaucoma. His research interests include the use of telemedicine in conditions such as diabetic retinopathy and have presented his research at national meetings. After residency, Dr. Moainie worked with Unite for Sight in Ghana and has done surgical trips with medical students and residents in South America including Guatemala and Ecuador. Fantastic, over the years my family has seen Dr. Moanine several times and he is simply excellent. After a long wait, the entire appointment felt rushed. I appreciate that he had a difficult patient but I had to ask for a glasses exam when he ended the appointment prematurely. He did not even ask why I came in,instead relying on the stock answers I had to provide on the form. Dr. Moainie is very thorough, clean, kind, and knowledgeable. I was late, unfortunately, and they still made time to see my son and I. Staff was pleasant, a couple of staff were a bit confused with my insurance and kept communicatingthe confusion throughout my appt amongst themselves with me present from start to finish, that made it a little awkward throughout my experience with vision exam and glaucoma tests. Aside from that, very clean, modern design, everyone is personable, & no issues with parking. Dr. Moainie has a great bedside manner and was very kind and efficient. I had some nausea/shakiness after my procedure and he helped me and made sure I was ok before I left. Thanks! Great appointment. Super professional got my eye problem diagnosed and treated right away. Plan on using Dr. Moainie as my full time eye doctor now. Dr. Moainie was awesome!!! He had a caring bedside manner. He explained every aspect of my exam to me and educated me on my condition and his recommended treatment plan. I will definitely recommend Dr. Moainie and Visionary Doctors. Dr Moainie was great ! He was thorough, informative, efficient, and engaging. Very friendly and willing to discuss symptoms. He's young enough to seem like he is still fully in the "ready to continue learning" phase of life, but seemed experienced enough to know his job well. This may seem like an oddcomment, but in the ever changing world of medicine I feel like it's a pretty important window of time. The staff is friendly and efficient the doctors have great bedside manners plus it's right on the metro line which makes it very easy to get to. Great doctor, he answered all my questions, very friendly personnel. The appointment was fineI suppose; the doctor only spent about a minute and a half with me, but he gave me a prescription for my eye infection. However, the follow-up after this initial appointment has been terrible. The medication I wasinitially prescribed was not available at any of my local pharmacies, and the manufacturer was out of stock. I have been calling repeatedly to try and get my prescription modified and sent to my pharmacy, but have only been forwarded along to answering machines by receptionists and have yet to speak to a medical technician. It was very thorough and I changed ophthalmologists for our entire family. Dr. Moainie was very efficient and answered all of my questions very efficiently. I would recommend this practice. The office is beautiful the staff all so friendly and nice. Dr. Moainie is excellent. He left me feeling relieved and confident that my vision will be completely restored. I highly recommend this practice. He was very cordial and helped me not be worried about my eye exam. Also advised me that I don't need another exam for a few years so yay! It was efficient and Dr Moainie was professional and friendly. I would definitely recommend! I had a great experience at Dr. Moainie's officeI didn't have to wait virtually at all - neither between check-in and actually seeing someone, nor between tests/screens and seeing Dr. Moainie, and everyone was courteous and professional.Dr. Moainie then did a great job explaining to me my condition and my treatment options, I had no doubt that he knew exactly what was causing my symptoms, which put me at ease immediately. Thank you! Nice office! Friendly staff...Dr. Moainie explained all my options and was very nice. I've been a contact lens wearer for over 20 years, and I get an eye exam every year. The customer service with this doctor was so unprofessional. He gave me a new prescription--that did not work. When I called to tryto get my old prescription, it was so hard to reach anyone. Once I did, they gave me some loaner lenses, but those ran out and I still couldn't get an appointment. Luckily, VSP is going to take care of having me seen by another doctor, at a different practice that returns calls and values patients. I won't ever go back to this practice and if anyone asks me, I will advise them not to use this practice, based on the negative experience I had! Professional, tells you exactly what he's doing, introduced himself, very patient, very knowledgeable, and didn't waste time! It was my first visit to Dr. Moainie’s practice and overall a delightful experience. Dr.Moainie’s and his staff do a great job. Dr. Moainie was very professional yet friendly He was very thorough and explained everything he did. I feel confident that my new prescription will resolve my eye concerns. Dr. Moainie is fantastic, i really like his overall disposition and his willingness help and listen Instead of overtalking or shrugging your concerns off. His personality just seems genuine. I definitely will stick to him. He was very informative, attentive, and kind. Dr. Moainie is a phenomenal doctor. He is personable, attentive, and confident. He treats the patient as a partner in the decision making and delivery of care. Professional and friendly. Not in a rush, but still a prompt visit. Highly recommended! Excellent doctor with great manners him, and his staff! He ran three or four tests to rule out any possibility I wasn’t treated as I should, and told me to call if I had more severe symptoms. Really enjoyed my experience here! The office was clean and the staff was friendly. They were very accommodating to my schedule as well! Dr. Moainie is an amazing doctor, and is very patient with me and my several eye-related medical concerns. I feel very lucky to have him on my health team. Excellent eye doctor -- will definitely be using him in the future. Nima was extremely welcoming and warm. He was super informative about all aspects of the exam, giving explanations about everything, including why certain thigs occur and what to keep monitoring. I would higly recommend Nima!